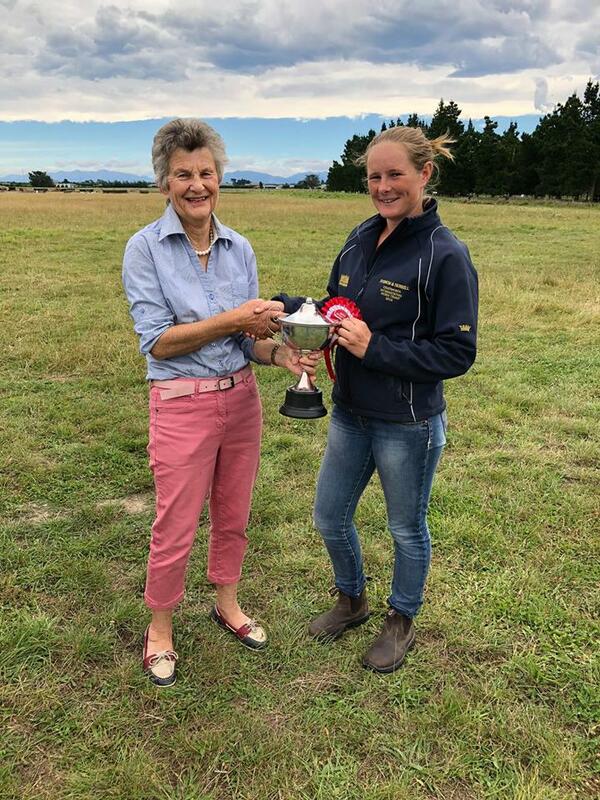 The impeccably maintained Mcleans Island NEC played host to the Dressage and Show Jumping phases on Saturday, while the Eyreton Pony Club grounds provided the picturesque backdrop of the Southern Alps for the Cross-Country on Sunday. 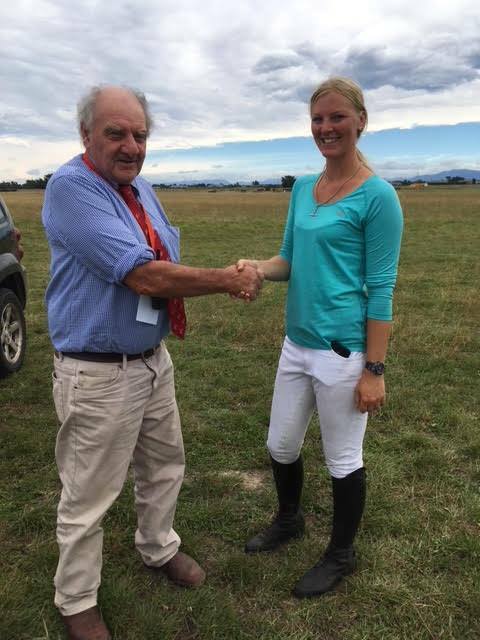 Raquel Cook was the winner of the ESNZ Eventing Style Prize. 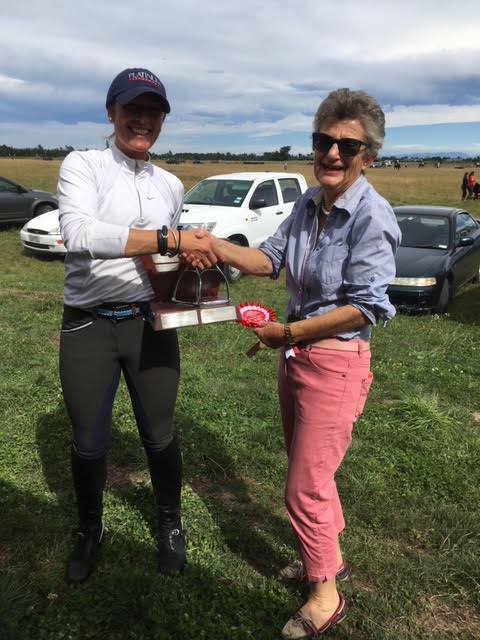 Courtney Davis being presented the Randwick Trophy (1*) by Eventing Canterbury chair and event director Marg Evans. Lydia Truesdale being presented the Holmslee Cup (2*) by Cross-Country Judge Ron Miles. Kirsty Sharapoff being presented the Atlantic Silver Stirrups (2*+) by Eventing Canterbury chair and event director Marg Evans. Local favourites Kirsty Sharapoff and Shoot the Breeze continued their fine form of late to take a narrow lead over Corey Wood and Pick Up Line at the completion of the 2*+ dressage. However a less than ideal lead up meant ‘Sarge’ he wasn’t feeling 100 percent and in the spirit of horse welfare, Corey opted to withdraw from the remainder of the competition, leaving Kirsty to cruise home on a score of 58.3. Lydia Truesdale and Allander Rocket nabbed their third 2* win of the season in the Ultimate Design and Renovation CNC2* class, moving from second place after the dressage into the position of overnight leaders after show jumping, and enjoying a faultless cross-country round to finish in first. Courtney Davis has returned By Hoki to the competition scene with great success in the Weatherbeeta CNC1*. The pair put in a consistent performance across both days, moving up from second place after the dressage into poll position – when leaders Brent Jury and Gorky Park collected 4 faults in the show jumping – and adding just 0.8 time faults to their score to secure the win. On mount two of five, in the Saddlery Barn CNC105, Anna Poole piloted Miss Renegade to a classy double clear performance that secured them the win, while in the U21 division Lucy Cochrane and Inspector Gadget put in a convincing performance to lead from start to finish. 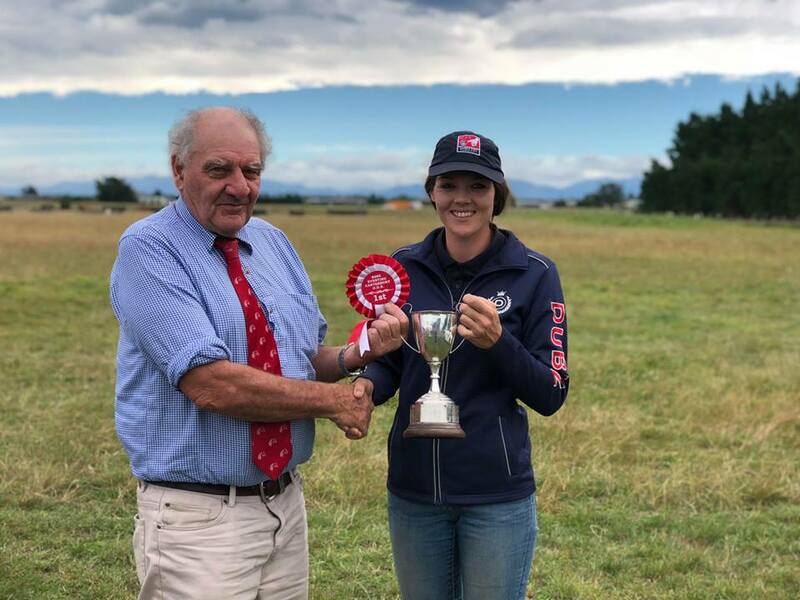 The Equissage CNC95 class was won by Emily Cammock and her starry youngster Y-Puna Frazer, who led from start to finish, and top honours in the U21 division went to Fabriana McQuarrie and Yippee Ki Yay. Melwood Equestrian sponsored the CNC80 class, where Larissa Srhoy and her new addition to the team, Heads Will Roll, led from start to finish. Poppy Coleman on board Again won the Farmlands Feedbarn CNC80 U21 division. In the CNC65, Luca Swale and Everton Hara Z headed the 19-strong field from start to finish. The Atlantic Silver Stirrups, awarded to the Ultimate Design and Renovation CNC2*+ class winners Kirsty Sharapoff and Shoot the Breeze, was first awarded in 1969 and has been won by Charisma (with Sharon Deardon at that stage), and Eventing Canterbury’s very own course designers Nick Pyke and Larissa Shroy. The Holmslee Cup, won by the Ultimate Design and Renovation CNC2* class winners Lydia Truesdale and Allander Rocket received, was first awarded in 1956 and has been won by Dusky Bay and Florence West an impressive 7 times! The Randwick Trophy, given to the Weatherbeeta CNC1* winners Courtney Davis and By Hoki, has been around since 1987 and past winners include Brent Jury (another of Canterbury’s current course designers). Raquel Cook (Grant) was awarded the ESNZ style prize for an exemplary round on board Karaka Commander. Ultimate Design and Renovation CNC2*+: Kirsty Sharapoff and Shoot the Breeze, 58.3, 1. Ultimate Design and Renovation CNC2*: Lydia Truesdale and Allander Rocket, 44.3, 1; Brodie Roberts and Playmaker, 53.2, 2; Mikayla Green and Star’s Ransom, 71.4, 3; Jessie Fitzjohn and Whats the Buzz, 75.3, 4; Anna Poole and Alfresco, 88.6, 5; Molli Thacker and Happy Go Lucky, 110.7, 6. Weatherbeeta CNC1*: Courtney Davis and By Hoki, 31.1, 1; Rebecca Smithey and SD Amourosi, 36.1, 2; Brent Jury and SE Gorky Park, 36.5, 3; Rebecca Wardle and WS Paradise, 37.1, 4; Paige Hardwick and Ivanoff, 37.8, 5; Lucy Turner and Carbon, 39.9, 6. Saddlery Barn CNC105: Anna Poole and Miss Renegade, 33.2, 1; Rebecca Smithey and Mr O Likely, 36.4, 2; Cam Robertson and Wairoa Renegade, 36.6, 3; Claudia Faulkner and Citadelle, 39.6, 4; Joneen Chalmers and Jacknthebox, 43.2, 5; Giles Gormack and Jeepers Creepers, 45.2, 6. Saddlery Barn CNC105 U21: Lucy Cochrane and Inspector Gadget, 32.5, 1; Paige Hardwick and Versailles, 35.8, 2; Kirk Magner and Kawhaka Concorde, 37.7, 3; Ruby Taane and Kennebrook Jester, 39.8, 4; Jessica Kerr and Waiwai Express, 40.5, 5; Anailise Hini and Bayross, 42.5, 6. Equissage CNC95: Emily Cammock and Y-Puna Frazer, 36.4, 1; Rebecca Wardle and Dingmac Eccles, 39.8, 2; Emma Simpson and Loodle Bug, 42.6, 3; Sarah Bastin and Mr Cosby, 43, 4; Maisie Hopkins and Tallyho Cleopatra, 45.5, 5; Emily Wingham and Beyond our Shores, 72.1, 6. Equissage CNC95 U21: Fabriana McQuarrie and Yippee Ki Yay, 30, 1; Charlotte Thomas and Te Puke, 30.7, 2; Sophie Jarvis and Time To Tango Too, 32.4, 3; Caitlin Shrimpton and Mister Puzzle, 32.9, 4; Eloise Thomas and Albereco, 32.9, 5; Danielle Chambers and Rosewood Zakee, 33.8, 6. Melwood Equestrian CNC80: Larissa Srhoy and Heads Will Roll, 26.8, 1; Alison Sutton and Aquila’s Altair, 30.8, 2; Rosie Flynn and Tiraumea Rumba, 33.7, 3; Raquel Cook and Karaka Commander, 35.8, 4; Molly Taylor and Southern Wish, 39.3, 5; Anna Poole and Oliver, 39.9, 6. Farmlands Feedbarn CNC80 U21: Poppy Coleman and Again, 32.6, 1; Annabelle Boon and Esperanza Power Trip, 34.2, 2; Lily Buckley and Stepping It Up, 36.6, 3; Lucy Baker and Smart Spark, 36.8, 4; Ginny Kerr and Sports Café, 37.6, 5; Sophie Thomas and Toffee Du Lux, 40, 6. Eventing Canterbury CNC65: Luca Swale and Everton Hara Z, 24.5, 1; Sara Rowley and Loco Moco, 32.4, 2; Grace Gormack and Sunset Hill Xmas Holly, 33.4, 3; Claudia Faulkner and Strate Shot, 35.3, 4; Hannah Udy and Ellangowan Khan, 37.6, 5; Tinesha Benson and Dragonbach Arwen Myste, 40.8, 6.